January is the month for real football in New Orleans. 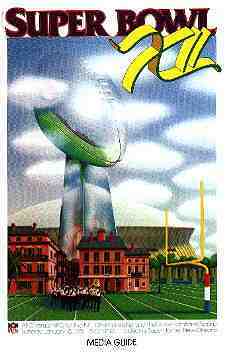 With the poor showing by the Saints in 1996, it is great for the Crescent City to be able to start off the new year with the biggest game of the National Football League's 1996 season--Superbowl XXXI. These six images from the Louisiana Division's collections recall Superbowls in our city's past, along with one Sugar Bowl game that has some significance for this year's fans from Florida. Cover of the NFL Media Guide for Superbowl XII between the Dallas Cowboys and the Denver Broncos on January 15, 1978 in New Orleans. The Chicago Bears defeated the New England Patriots in the twentieth anniversary Superbowl in New Orleans on January 26, 1986. 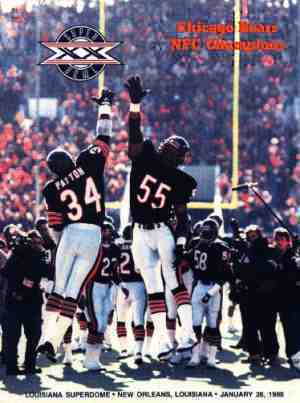 Here the great Walter Payton and linebacker Otis Wilson celebrate an earlier victory with a high-five on the cover of the Bears' program for the game. 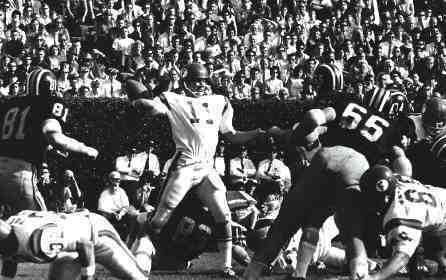 Roger Staubach drops back to pass against the Miami Dolphins in Superbowl VI on January 16, 1972 at New Orleans. Dallas was victorious by a score of 24-3. One of the New Orleans Police Department's finest, Patrolman T.R. 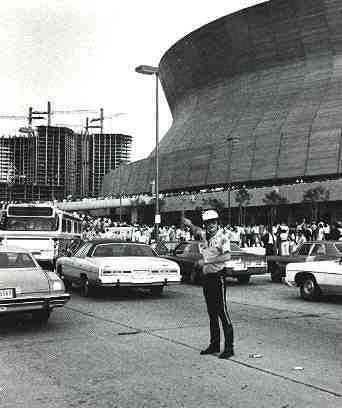 Rainer, directing traffic outside the Louisiana Superdome on the occasion of the first ever football game to be played in the Louisiana Superdome. Unfortunately (unless you're a Texan), the Saints lost that 1975 exhibition opener to the Houston Oilers by a score of 13-7. The Superdome, of course, went on to host many more Saints games (including a few wins), along with four Superbowls (1978, 1981, 1986, and 1990). 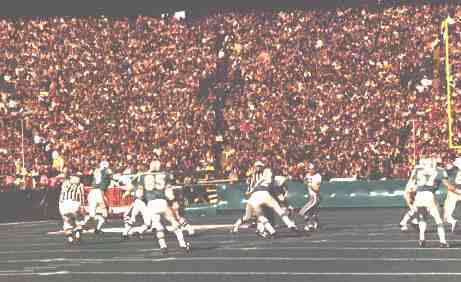 Tulane Stadium, longtime home of the annual Sugar Bowl Classic, hosted the 1970, 1972, and 1975 Superbowl games. 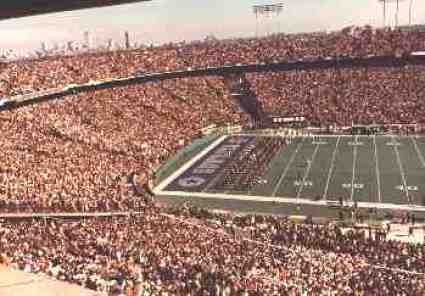 This view catches some of the entertainment that accompanied the 1972 event. It also captures the New Orleans skyline before it came to be dominated by the city's new domed stadium. And who knows--1997 may yet be the year that the Saints finally find their way to the Superbowl.